Looking to spend some time in nature and discover the UNESCO World Heritage Gondwana Rainforests of Australia? 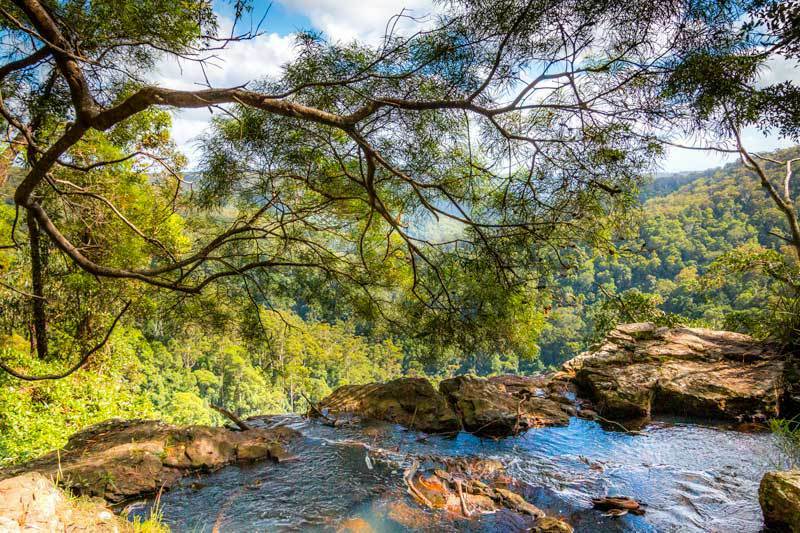 Discover the Purling Brook Falls track and the extension down to Warringa Pool plus some other stunning must-visit spots nearby. Summer is in full swing and one of the best ways to beat the heat is to head into the National Parks. It’s a few degrees cooler up in the mountains than it is in the city or at the beach. There’s also a bit of respite from the beating sun under the forest canopy and some fabulous pools for a cooling dip. 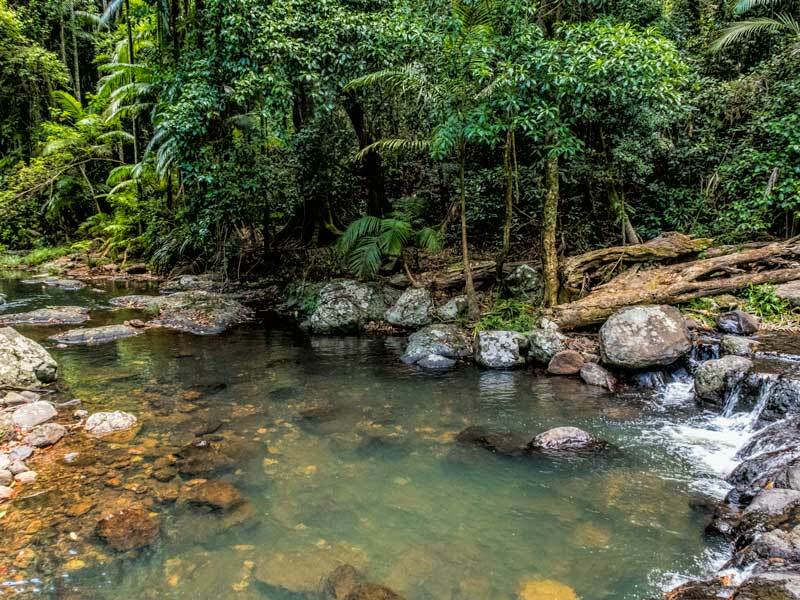 Here in Queensland on the Gold Coast, we are blessed with 3 incredible hinterland national parks that are all part of the UNESCO World Heritage Gondwana Rainforest of Australia. 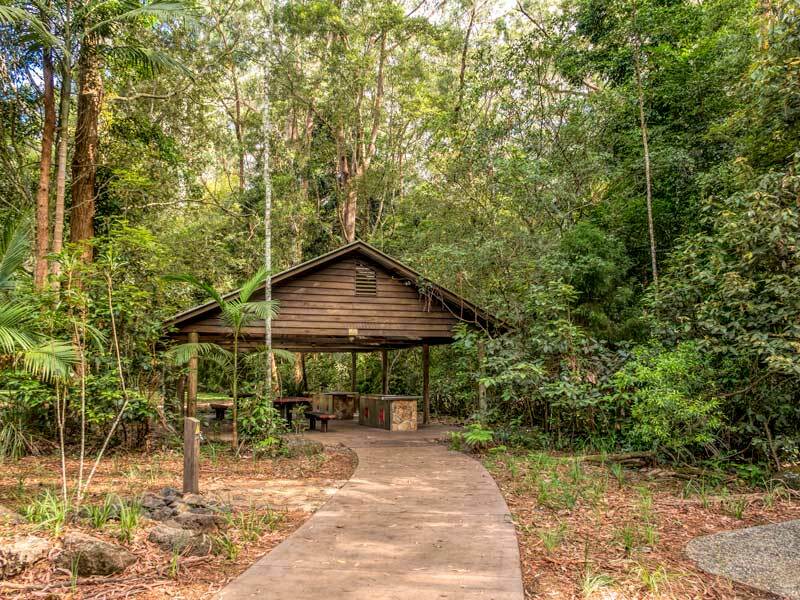 These parks are Tamborine, Lamington and Springbrook. In mid-January, the hight of summer here in Australia, we decided to head back up to the Purling Brook Falls and Warringa Pool tracks in the Springbrook National Park. 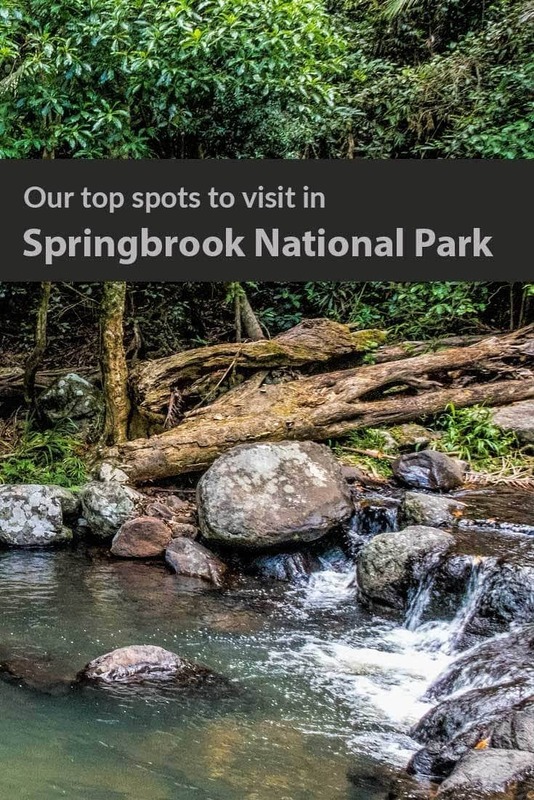 Getting to the Springbrook National Park will take you around 1.5 hours from Brisbane or just under an hours drive from the Gold Coast beaches. 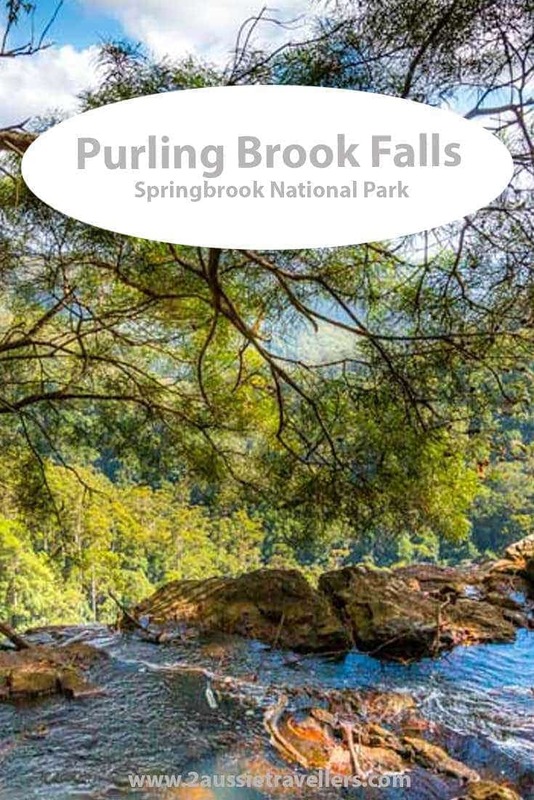 Once inside the Springbrook National Park there are two main routes, one continues up to the Natural Bridge and the other heads out to Purling Brook Falls, Twin Falls and the best of all Lookout. Our pick for the day was the Purling Brook Falls track. This is a 4 km loop starting from the Gwongorella Picnic Area. You can walk the loop in either direction you choose but we took the recommended clockwise route. Going around this way you are still going to have to walk back up to the top (obviously) but it means going down the majority of the stairs on the way to the base and back up using the winding path sections. There are some stairs coming back up but the slope is more gentle. The trail is well formed and signposted, there are a few parts where you’ll need to step over tree roots but there is no climbing or difficult stretches. After heavy rains, the track can get a bit slippery and muddy but the bonus of this weather is that the falls are even more spectacular. The trail passes by the top lookout for your first view of the drama of these 109-metre horsetail falls before descending into the valley below. The first part of the track is through a forest of mountain ash and eucalyptus. As you move down through the lower levels you’ll come to more typical rainforest palms, cycads and vine forest. After 2 km you come to the base of Purling Brook Falls, there are several vantage points here to see it from and it is quite an impressive wall of water most of the time. If it’s been very dry it can be a bit less dramatic. The pool and vegetation surrounding it is home to some protected wildlife including native frogs and the spiny blue crayfish. For the sake of the fragile ecosystem they ask that you don’t climb down and swim here but if the sight of those icy cold falls has you tempted there’s a sidetrack that takes you to Warringa Pool, an equally appealing alternative. 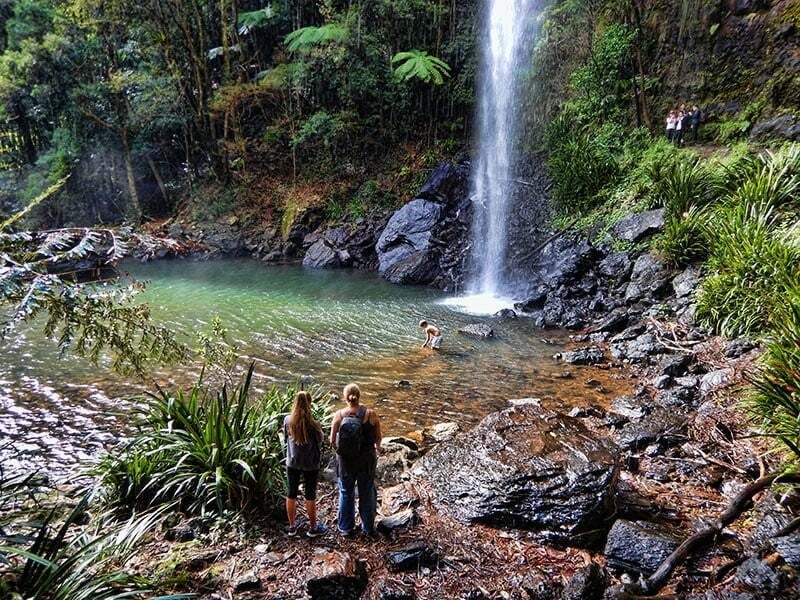 This is one of the best swimming holes in the Springbrook National Park and easy to get to. Continue on the left path as you come to Purling Brook falls, it’s about another kilometre down to the falls and you walk back the same way to this point then continue along the Purling Brook loop back to the carpark. A 6 km walk in total. On this section of the track, you’ll pass by the top of Tanninaba Falls before descending further through the massive granite boulders and palms to the pool. The Warringa Pool is ideal for a dip to freshen up. Like any mountain swimming hole that’s fed by a waterfall it’s going to be cold at any time of year but cooling down is the point of it right. If you don’t feel like diving right in there are areas where you can sit with your feet in the water or wade in the shallows. In addition to the main hole, there are a series of pools and small cascades that you’ll come to if you rock-hop your way a little bit further back upstream. These quieter spots are my favourites. The sitting space is a bit limited so if there are a few others already there you can rock hop a little further back upstream and find another rock shelf to spread out on. Some types of leeches live in freshwater pools, we didn’t have any issue ourselves but others have mentioned encountering the little worms when swimming here. The car parking and facilities at the Purling Brook Falls trailhead are the Gwongorella Picnic Area. This area has had a fairly recent renovation so it’s all looking very well kept but some of the smaller plants are still getting established. The toilets here are composting as you’ll normally find in the National Parks but they are kept clean. There’s space to change if you’re planning to take a dip in the pool down the track and outdoor taps (not for drinking water) if you need to wash off or clean your boots in wet weather. The barbeques are new and were kept clean when we were here. There are picnic tables positioned both under the covered area and also set in under the shade of the trees. We have our own fave picnic spot not far away that I’ll come to shortly but this is a great facility. There’s parking for around 20 cars and if you’re there early you can score one in the shade of the trees that’s nice and close for carrying your picnic gear in but there’s also street parking that is regularly in use on a busy day. When you’ve finished the walk here and perhaps stopped for a picnic or something from the cafe just up the road there is more to see in this area if you have the time. Continue on another 7 km following the marked turnoff ona the right to the Best of All Lookout. 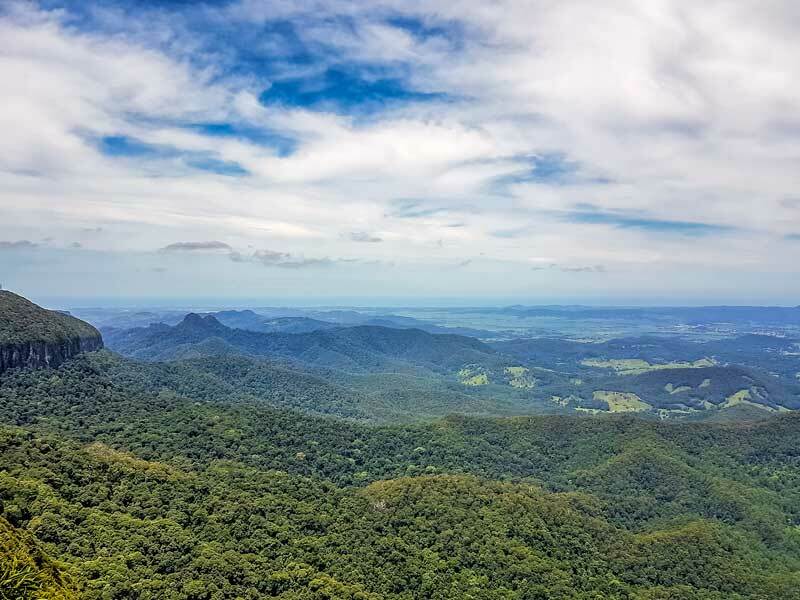 After the great views at Purling Brook and other places in Springbrook National Park that sounds like a massive oversell but it’s a short 600-metre return walk from the carpark and you won’t regret it. It’s only a 7 km drive from Purling Brook Falls making it an easy addition to your day in the mountains. Another 4.5 km down the road there is a short detour off to the Canyon Lookout. This is a lookout rather than a trail head and only a few steps from the car but you can see Twin Falls and Rainbow Falls from here. You can also see all the way out to the coast. The enormous canyon in front of you is part of the Scenic Rim as all of this area is. It’s the remnants of an ancient shield volcano that formed 26 million years ago, the landscape continues to evolve every year due to the extremes of weather, erosion and rock slides. It’s only a short stop but if you are continuing on up the road to more of the walks and picnic areas it’s another perspective on the area. Another 750 meters along this road and you’ll come to the car parking area for the Twin Falls track. I’ve got all the details and more photos for this walk covered in the linked article but wanted to mention it here too as it’s so close. For many, this would make a great combination doing one of the tracks in the morning and the other in the afternoon. Twin Falls circuit is a 4 km loop, there are 4 waterfalls along the way, an fairly easy grade 3 walking track, and that great swimming hole too. At the top, there is car parking, toilets and a couple of picnic tables. Drive another 1.5 km and you’ll come to the end of Springbrook Road at the Goomoolahra falls and picnic area. This is my favourite lunch stop, there are no shops or cafes so you need to be self contained but there are great tables and BBQ facilities under the shade of the trees. The shallow water flows alongside the picnic spots to the top of the falls creating a cool and peaceful environment. We like to settle in for a while after our walks to just enjoy being in nature. On this trip, we had yellow robins flitting around above our head and a kookaburra who positioned himself next to us to keep an eye on things. I like to pack up a picnic of cold meats, crackers, cheese and pickles or this time I found these picnic pies on Pinterest so cooked those the night before to pack into the cooler. The OZTRAIL loungers were a pre-Christmas addition, they’re super comfortable and pretty much lie flat for an afternoon siesta or to relax with the kindle after lunch. We’ve also just added this Wacaco Nanopresso coffee press to our kit and I’m absolutely loving being able to make a great quality espresso wherever we are, especially in remote and stunning locations like this. We like to head up into the National Park early. Staying locally is ideal but if not, an early wakeup will ensure you get a shady carpark at you chosen trailhead and enjoy the rainforest at it’s absolute best without the crowds. 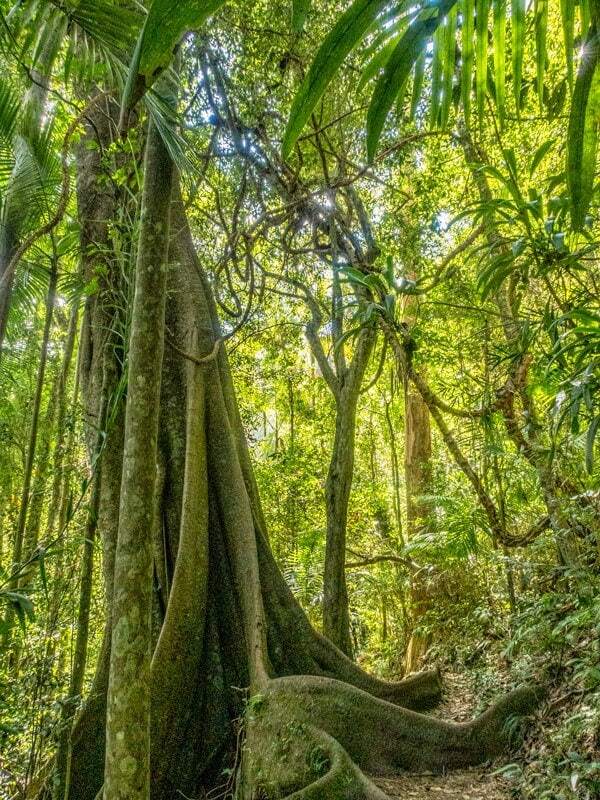 Having said that a night or two within the world heritage listed Gondwana Rainforest is highly recommended. If you haven’t done it before the night sky is incredible, the silence and being totally immersed in nature as the sun goes down is a very special experience. These are a few options really good options that offer all the comforts you might want. The Sanctuary is a self-contained heritage one bedroom cottage with a high end fit out. It’s located within the National Park and includes a continental breakfast to enjoy on your private balcony. There’s a functional kitchenette meaning you can prepare your own meals and you also have the option of having your evening meal served onsite and enjoying one of the local cafes during the day. The Sanctuary take single night bookings which makes it easy to incorporate into your itinerary or as a romantic city escape, with just the one chalet on the property peace and privacy are guaranteed. The Mouses House Rainforest Retreat describe their romantic rainforest chalets as ‘rustic-chic’ while their guests describe them as excellent, 5/5 and bucket list. There are 14 chalets nestled into the native bush, a great spot for a romantic retreat in a natural setting. The chalets have spa baths, wood burning fireplaces and private outdoor hot tubs. Hiking is a physical activity, these are natural spaces and while safety precautions are in place you need to be aware of your own capabilities and select a trail that suits you and your travel companions. Fortunately, there really are options in the Springbrook National Park to suit everyone. Walking tracks in Australia are graded, the Purling Brook Falls and Warringa Pool track are graded 3 which means they are good walking quality, suited to anyone of moderate fitness and can be used in most weather conditions. We have an article that explains the Australian walking track grading system in more detail if you want to take a look. 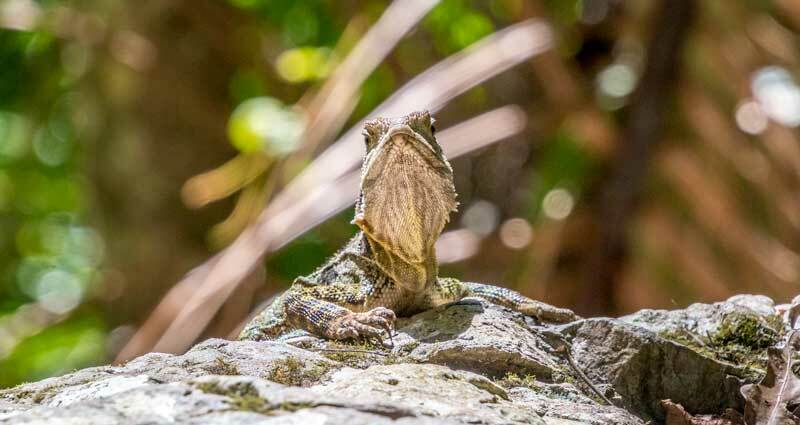 Springbrook national park is the rainforest home to a wide variety of different wildlife. Many of them are protected, some are endangered and their environment is fragile. Be aware of the wildlife around you for your own safety and theirs, don’t try to touch or pick them up and stay on the tracks. Australia has a bad wrap for scary animals but we have cute and fascinating ones too. Yes there are snakes in the national park, yes some of them are highly toxic but if you stay on the paths and watch where you walk they are highly unlikely to be a threat to you. I have come across a red belly black snake sunning itself across a hiking path and spotted other snakes near the trails over the years so keep your eyes open but don’t stress about it, they are there, you are there, it’s all good. Two tiny critters that are common out here because they like humidity and moisture are ticks and leeches. The common bush tick is also called the paralysis tick, it can burrow into the skin and needs to be removed with care as soon as possible. Most adults won’t react beyond localised irritation but if you do have symptoms or believe you haven’t removed it fully get medical attention. Leeches are considered more gross than dangerous but a few people will develop an allergy to them after multiple bites. The best prevention against both ticks and leeches is to spray legs, socks and shoes with insect repellant as they are mostly found in the damp leaf litter on the path. It is also more likely to encounter them walking during or after heavy rain. I like to give myself a good spray with repellant on all exposed skin anyway because mosquitos are a health risk all around the world and I seem to be a magnet for them. On a more positive note keep your eyes open for wallabies and the smaller related pademelons that are adorable wild icons of Australia. There are also possums, gliders, bandicoots, quoll, echidna and if you are very lucky platypus to be seen within Springbrook National Park and a vast diversity of bird life. 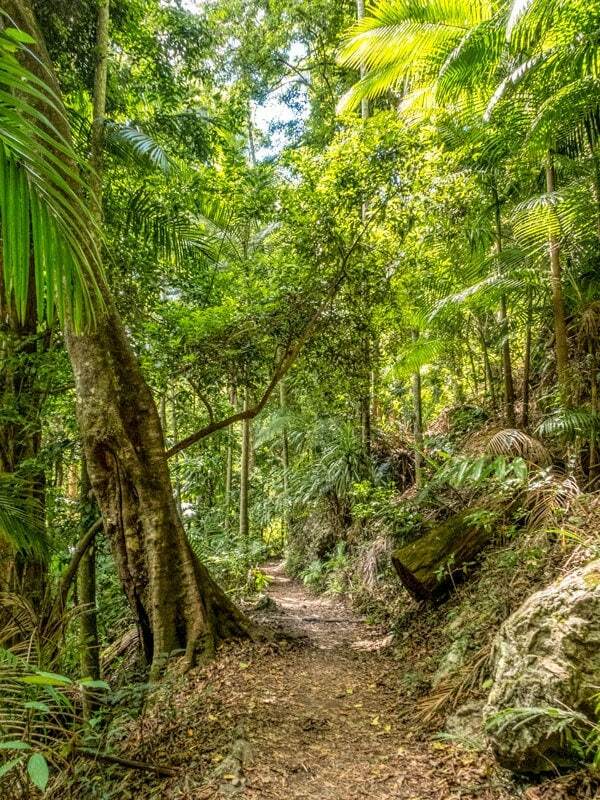 It’s hard to go wrong with a day (or more) in Springbrook National Park, or at any of the others located on the Gold Coast and around South East Queensland. There’s as much or as little to do as you choose and as we’ve shown here it’s so easy once your here to put together a combination of hikes, picnic spots, lookouts and time to relax in nature. These images can be shared in Pinterest for future reference.